Windows 10 patches - is WSUS necessary? We currently have a windows domain. When thinking about Patch management on the network and thru Windows 10, doesn't the OS automatically handle patches through the updates on each system? Is WSUS really necessary to push out patches, when the Windows 10 platform does a fine job on its own to apply updates? So here is a broad topic, which is encryption. When looking at the security controls of a network, it seems that encryption is a must. My question is what things should be encrypted on a network? Are we talking encryption on a intranet? Email? File sharing? What are some of the suggested practices in terms of what items need to be encrypted and HOW can that be implemented? Does it happen at the firewall level? Is it configured on the switch? This is a broad question, but it will give me some direction when seeing the replies. If a 802.11. network did not encod data, would signal to noise ratio, be still an issue? Throughout the day a good portion of my users experiences internet dropouts and waiting on proxy tunnel when they are on a browser. I have inherited just recently our proxy server. I don't know how it was built or for that matter how it works. The user who did know has left the company and I'm not sure where to start. Any help would be brilliant? I spend about $45/month for unlimited bandwidth and wonder if I can save money with pay-as you go? I use almost none each month. Who can I switch to and still have the Verizon cell network, or similar? in the EIGRP summarization like the example below , I would like to know for instance when R1 Receives a query for a route 172.16.5.0/24. Will it check its routing table before it decides to put it in a bit bucket (Null0) ? Also for instance R1 will receive a query for a route 10.10.10.0/24 , will it also check its routing table to see if it has a route for it before it decides to send it to Null0 ? With logged in with SSH, I curled 'localhost:3003', then response returned as expected. This is obviously insufficient configuration on web server, but I don't know how. I am grateful if you could advise me. Need help understanding with a good video or example of terms what the Name (RDN) in Permission Settings means and does specific to listed value. Is there a good tutorial or explanation of the RDN (Names) Identifying the various Groups and Users I have listed here. I assume some are defaults and some may be OS specific and others specific to applications I have installed. I understand a fair amount about users and rights however. I assume that the "In Folder" means that the Name RDN (image below) is included in the Permissions setting. Therefore the member of the group or the specified user has permissions to use RDP. 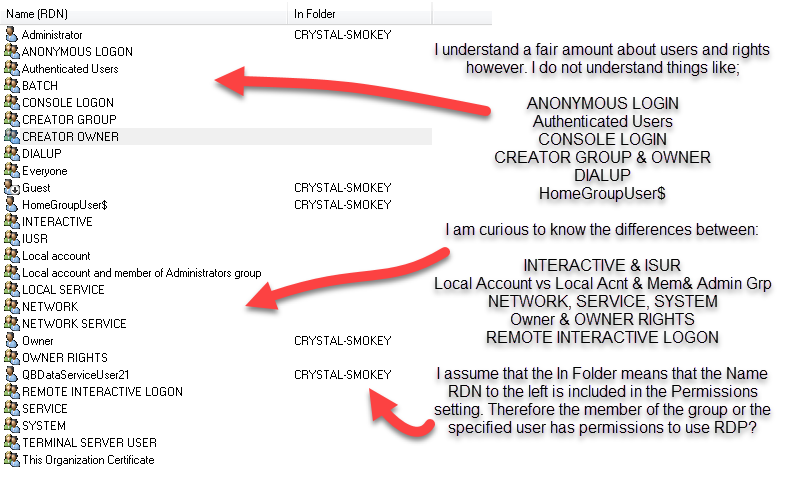 I used to set up Business Objects Enterprise Users Groups Object and Folder Rights. So I have basic understanding. Any direction "pointable" is appreciated. Thank you. Is slither.io / wings.io an MMO, or computer enemies? They have what seems to be a score table with different names, but I question whether they are people or not, since there seem to be so many? Is it datagrams over TCP? Many connected servers all over the world? I have handheld devices that I cannot change the domain path (hh.domain.com). They point to an address and work perfectly outside the building. Once inside they cannot route to the external address. I have a ddwrt router and I need to be able to create a table edit to resolve that address locally. How can I configure this ? I need to a) rename a Active Directory Domain and b) upgrade servers to either 2012 R2 or 2016 (heard a few issues with 2019, so that can wait). Would you rename, then upgrade, or would you upgrade first, then rename? The internal domain name is from a previous company (oldcompany.com) that was upgraded over the years from the NT days, so the network is actually quite old. 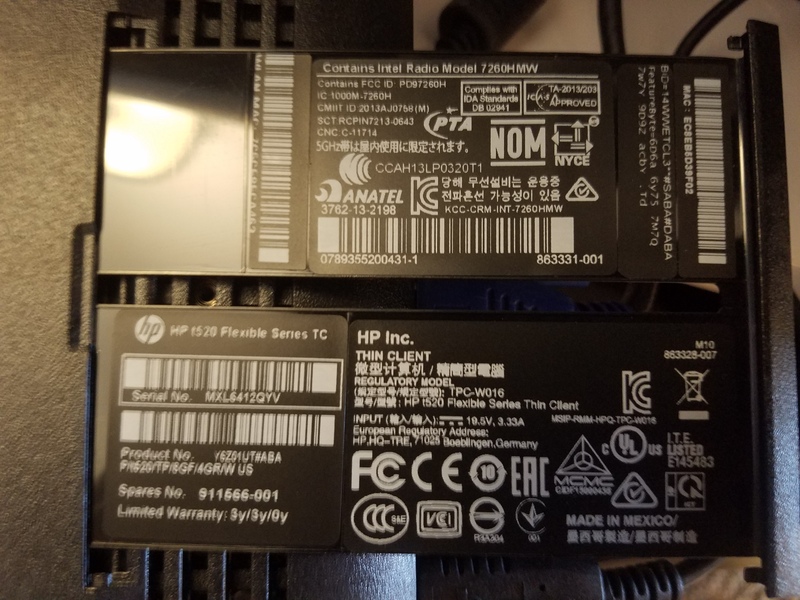 New company bought all the equipment because the old one went belly up, but continued using domain internally, except for email. Exchange had been outsourced with new company, so all the clients were pointed to the email hosting company. Old company's email has been offline for a number of years now. Idea was to be as least disruptive, but that may have been a bad call at the time. Now I want to fix it all up. The new has their own web presence under newcompanyinternational.com. I was thinking of just using newcompanyint.com internally, which is actually what the current email points to. Just trying to get a feel before proceeding. I need to design a topology of our network for a meeting that shows all the network servers and communication appliances. What software can I use that is simple or free to do so? Attachments is taking too long for scanning with ATP attachments enabled in office 365. Why and how to fix this? Is there way to exclude from scanning? we work with a Windows 10 image and deploy that on many machines. We doing that in the same network we will get problems (and do have them right now) caused by the same SID. The question now is: how to change a SID on a Windows 10 system without killing the system. Thing is that I ran a tool NewSid.exe (from Microsoft) and that totally killed 2 machines. I red something about sysprep /generalize, but we do not work with sysprep. The tool we use to deloy images is Acronis, but whatever tool it is, the problem is the same: we cannot have equal SID's in one network. What is the command to check remote mgmt card is installed on windows server using command prompt? Is there any other way to find that card is there or not? If I were to use Nagios, would it need to be on the same network as the infrastructure it is monitoring? You have the chance to speak with a CISO, what questions would you ask them? I have some questions of my own. But I wanted broader perspectives from people like you. So if you had the opportunity to ask some questions from such an individual, what sort of questions would you ask them in order to understand the spectrum of their security understanding/experience? 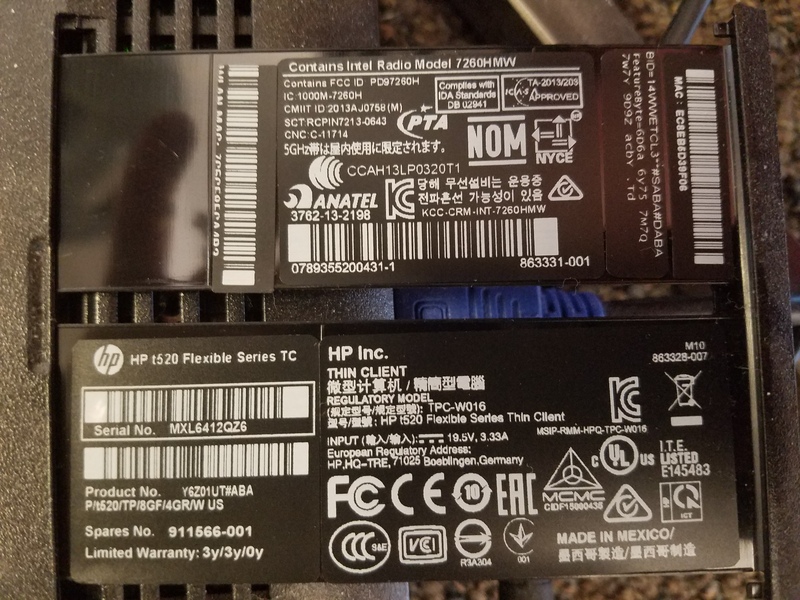 I have an VPN to a foreign network which is established by the two routers. I can ping every other comuter in the foreign network. From a computer inside the foreign network everything works fine which does'nt work through the VPN. This behaviour ist new. A couple of days bevor, everything worked fine. 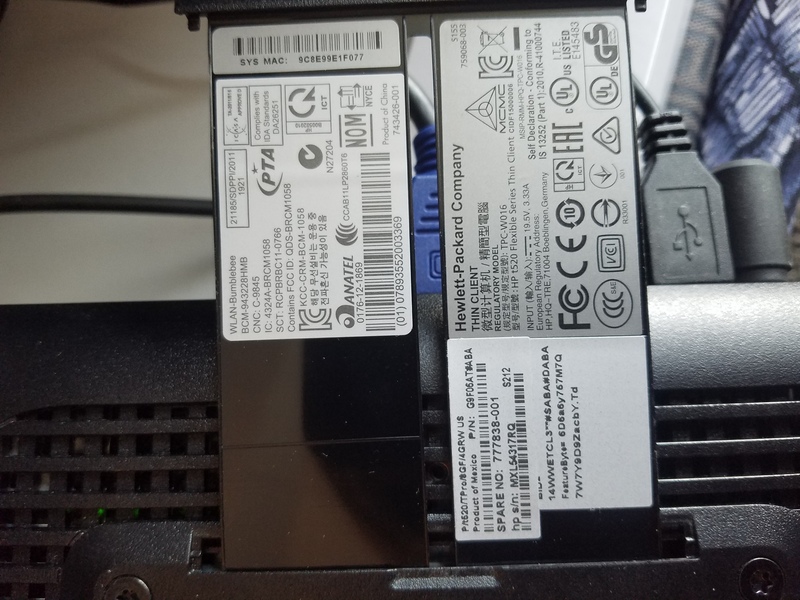 This customer started out with a class C subnet of 172.18.2.0/24. They are at the point where they need more IP addresses. They have a ton if wireless APs and little switches that I could move to another subnet which would give them a lot of room to expand. The problem is that if I move the APs and switches to another subnet they lose internet on those devices and a lot of nice things that go with it. They have a real nice SonicWall TZ300. How can I move those devices to a different subnet and still give them internet?